There was an air of mystery when Henry Jones, the third generation dairyman of Jones Brothers in Middlesex St, summoned me over to see him in the Summer. Closing the office door discreetly and looking me in the eye with a good-natured intensity, he revealed he had a story to tell me - but first I had to agree not to disclose it before the Lord Mayor’s Show. Once I had pledged my word, he proudly unrolled the blueprints upon his desk, confiding that Jones Brothers had accepted the honour of entering the Lord Mayor’s parade and had been placed at an impressive ninth position in the hierarchy of the running order, out of nearly one hundred and fifty entrants. The elaborate designs, which Henry showed me with such conspiratorial delight, were to transform a milk float into a model of one of the medieval gates of the City of London, complete with crenellated turrets. In 1877, the first Henry Jones drove his herd from Abergavenny in Wales to Middlesex St and founded the dairy in Stoney Lane. Today his grandson Henry Jones presides over the longest established family business in Petticoat Lane, where his young son, the fourth Henry Jones, also works. This is a family with a long relationship with this particular web of streets at the boundary of the City of London. “I was born here,” Henry will tell you proudly, referring to the former dairy, which has since disappeared beneath the modernist concrete development where he now has his office. So it was in the light of this family history that I came to appreciate Henry’s passionate enthusiasm for the parade, demonstrating that the language of pageantry is as vibrant as it ever was. The design of the gatehouse refers to the gate (or ‘Aldgate’) to the City of London that once stood here, where Geoffrey Chaucer once lived up above the gatehouse. Henry Jones – who is an independent councillor in this ward known as Portsoken – told me the name Portsoken is Norman French and refers to the ‘soke‘ (or district) outside the ‘port’ (or gate), once used by the knights of old for jousting. Consequently, he was employing a knight in armour to ride with a lance in front of his milk float, representing the ‘knightengild’ who were given land here for service to King Edgar. And the Portsoken Militia, the eighteenth century police force, reformed recently for ceremonial occasions would be marching alongside the milk float in their scarlet uniforms as guard of honour. 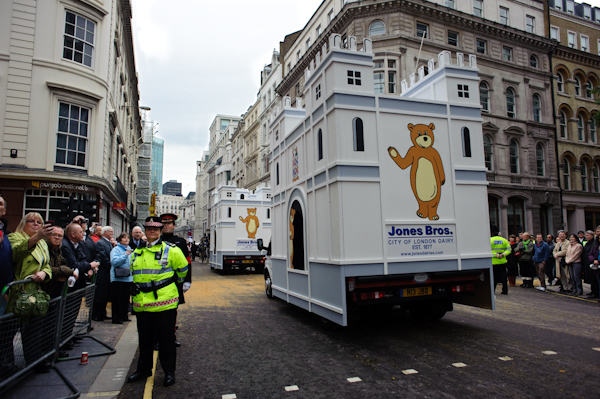 Once Henry had conjured the beguiling image of how the float and entourage incarnated the history of Portsoken, he pointed out the Teddy Bears adorning the gatehouse, which were puzzling me. These were Henry’s whimsical gesture to his friend Mike Bear, the Alderman of Portsoken, who was due to become next Lord Mayor of London. Henry’s conception was exactly in line with the original function of the parade when the burghers of the city used their floats to declare their status and demonstrate allegiance to the new Mayor. Eager to share his big secret, Henry was excited to inform me that he had already submitted his design to the Pageantmaster and won approval for its suitability. I promised to keep my lips sealed and he agreed to invite me over on the day before the Lord Mayor’s Show for a privileged glimpse of the grand design. 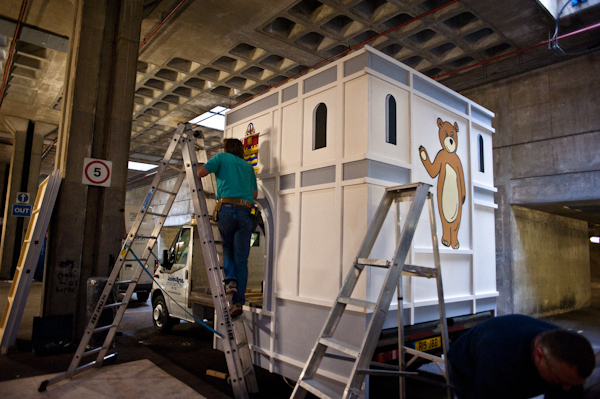 And so last week, I was ushered into the garage in Middlesex St where the float was being assembled behind closed doors. Men on ladders were attaching painted panels to the modest milk float and staging a metamorphosis worthy of the ugly duckling that became a swan. I shook hands with Stuart Stanley, veteran West End theatrical designer, who had been hired to fulfil Henry’s vision. 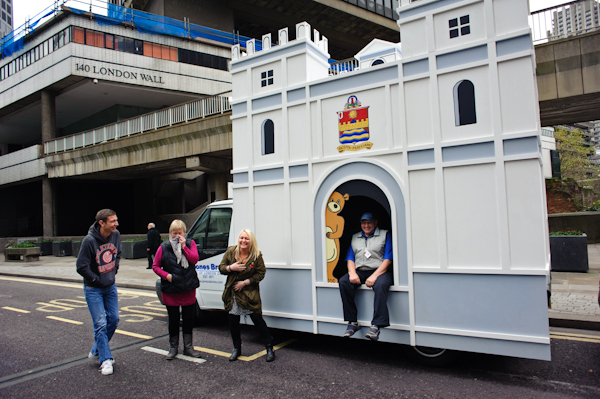 As the gatehouse came swiftly together, Henry proudly explained that he and the other members of the Portsoken Ward Club, who were co-presenting the float, had been staging raffles and fundraising for four years to raise the money to realise this dream. On the day of the parade, I greeted Henry outside the Guildhall. He was resplendent in his robes as a deputy Alderman and radiant with joy as he prepared to climb into the open coach to ride behind the Lord Mayor, while the rest of his family including his son, the fourth Henry Jones, drove the float. 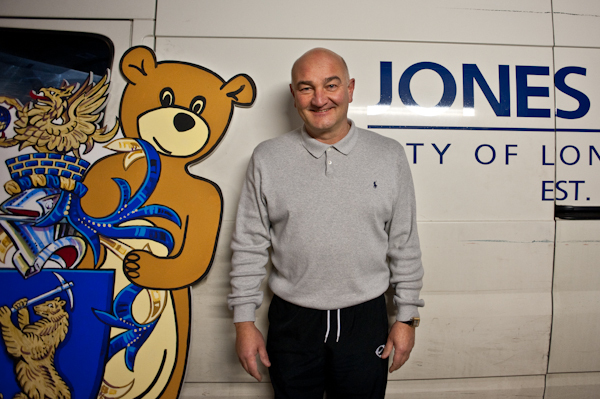 I never learnt what Mike Bear said when he first saw the bears upon the milk float transmogrified into a medieval gatehouse – on the glorious morning of his inauguration as the six hundred and eighty third Lord Mayor of London – but I am sure he cannot have been disappointed by this magnificent gesture which comprised a heartfelt tribute from Henry Jones, the third generation dairyman of Middlesex St.
Henry Jones on the day before the parade. 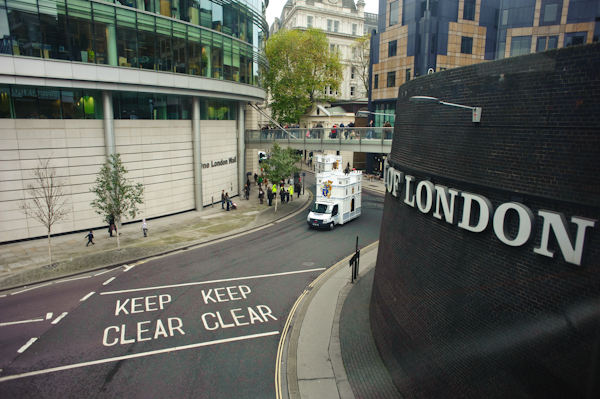 The milk float gets a makeover. 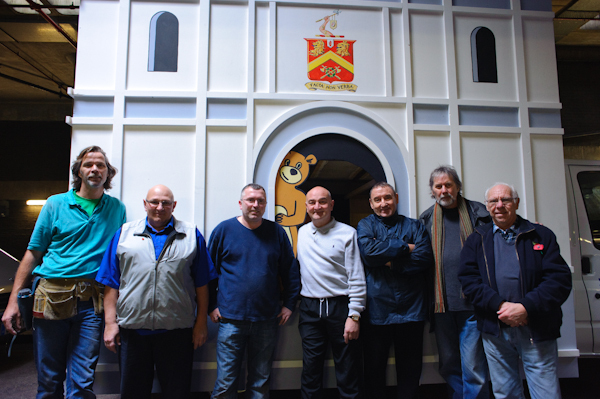 The team that transformed the milk float, Stuart Stanley the designer is on the far left. 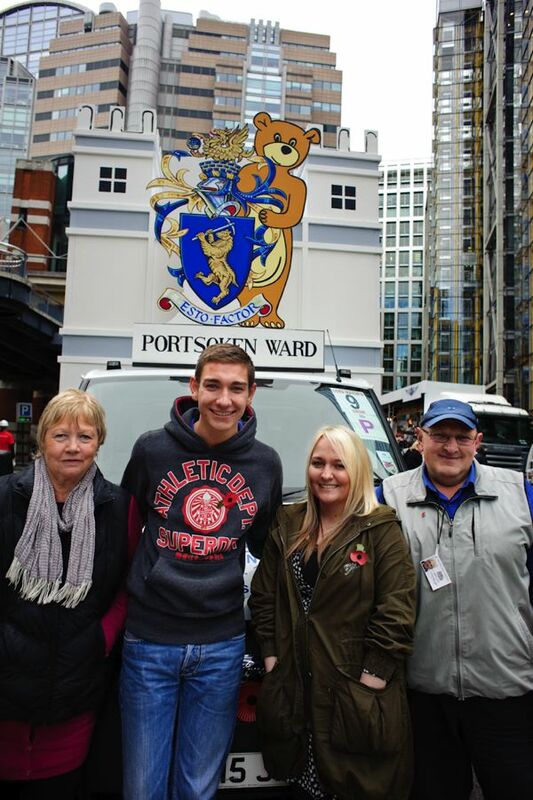 A moment of hilarity for the Jones family prior to setting off. In the centre is the fourth Henry Jones with his sister Lucy, and flanking them Trevor Jones and his wife Hazel. the fourth henry jones just about killed me. bless their hearts!